Aung San Suu Kyi, the once globally revered de facto leader of Myanmar, has been stripped of yet another prestigious award for her part in the Rohingya crises. Amnesty International announced on November 12 that they had revoked the Ambassador of Conscience Award for her “shameful betrayal of the values she once stood for”. 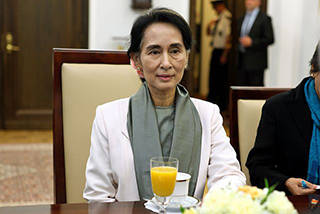 Suu Kyi Administration is accused of being actively involved in the commission or perpetuation of human rights violations against the country’s Rohingya Muslim minority since coming to power in April 2016. Amnesty’s decision to withdraw the title is the latest in a series of international awards revoked from the Nobel laureate once heralded as the face of democracy in her country but whose Government is now facing escalating calls to be investigated by the International Criminal Court for War Crimes. To date she has been stripped of her honorary Canadian citizenship; her honorary Unison membership, her US Holocaust Memorial Museum Elie Wiesel award as well as London School of Economics Students’ Union honorary presidency. Her freedom honours from the Cities of Dublin, Edinburgh, Glasgow and Oxford have all been revoked. And Oxford University, where she studied, had taken down her portrait and remove her name from a room. Halfway through her term in office, and eight years after her release from house arrest, Naidoo expressed Amnesty’s grievous disappointment that Suu Kyi had not “used her political and moral authority to safeguard human rights for the Rohingyas.” Naidoo also cited her apparent indifference to atrocities committed by the Myanmar military and increasing intolerance of freedom of expression. Amnesty’s Secretary General, Kumi Naidoo, wrote to Suu Kyi to inform her that the organisation was revoking the 2009 award. “Today, we are profoundly dismayed that you no longer represent a symbol of hope, courage, and the undying defence of human rights. Amnesty International cannot justify your continued status as a recipient of the Ambassador of Conscience award,” wrote Naidoo. During the campaign of violence unleashed against the Rohingya last year, the Myanmar security forces killed and raped thousands of people, detained and tortured men and boys, and burned hundreds of homes to the ground. Fleeing the violence, more than 720,000 Rohingya escaped to neighbouring Bangladesh. A United Nations report has called for senior military officials to be investigated and prosecuted for the crime of genocide.